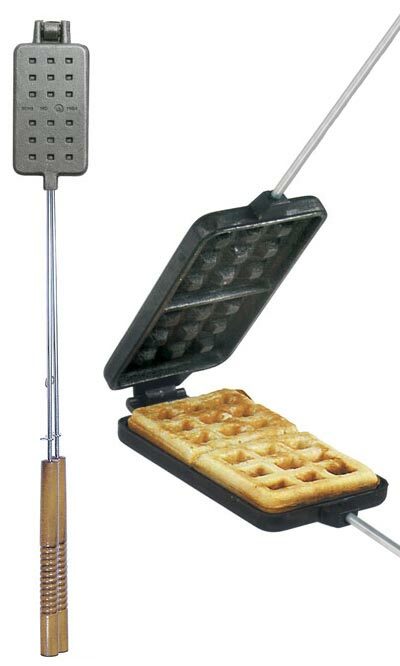 Treat your fellow campers to a delicious morning meal using these Rome Cast Iron Waffle Irons. Each of these hardy units cooks two sweet or savory waffles at once over a campfire, for a fantastic and unexpected meal. The cast iron topper on each generous handle heats quickly and evenly, allowing you to create plenty of waffles. Their hinged design makes them easy to fill in moments, and a latch on the 12.5" long, stainless steel handles keeps each unit securely closed during cooking. These lengthy handles keep you safely away from the fire, and 9" long wooden ends insulate the stainless steel rods for easier handling. The cast iron head remains durable for many years of service, becoming more seasoned with each use, and the included packaging offers plenty of recipes and variations. Enjoy warm waffles at your next campfire meal in these Cast Iron Waffle Irons. Ten year warranty. Note: This case pack includes 2 of the Rome Cast Iron Waffle Irons.